Our second gig “Acwstic Afiach” was a great sucess again, we opened up a temporary free shop, Cardiff’s anarcho-feminist zine “FFWFF” launched its second issue and The Next Leg came and did a big piece of art on the wall in the garden at The Wells Hotel. Local poets Emma Syrup and Mab Jones opened up the evening in the jam-packed room, and were followed by local anarcho singers Taffy Twp and Daf Killnaboy. Faith Taylor from Cambridge played an energetic set and was followed by Lost Soul, a singer who has been on tour constantly for 18 months and sing his antifa, anti-police, general awesome songs! :] Thanks to everyone that came and made it the amazing event it was!!! There will be new art and CYMRU AFIACH, our first release will be launched!!! See you there! Efa Supertramp will also be on Huw Stephens’s show on BBC Radio Cymru (26th November) this evening talking about the label, and the first release ‘Cymru Afiach’ to be launched December 15th! 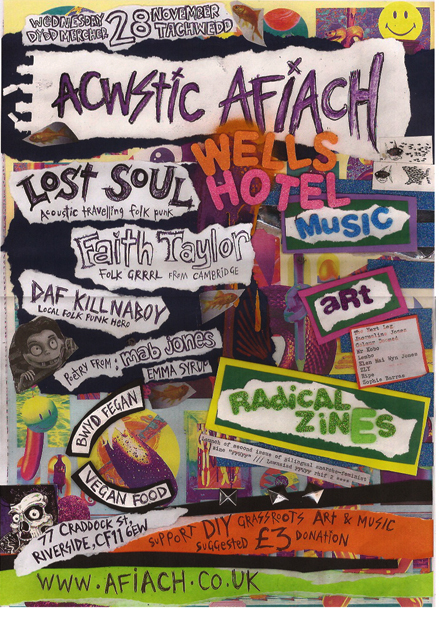 ACWSTIC AFIACH 28.11.12 – an evening of acoustic music, radical zines, vegan food and art !